Red Apple Reading helps kids become successful readers with a unique reading program that gets results. Lessons come to life with loveable characters, wholesome storylines, and engaging activities! Red Apple Reading works like a reading tutor for supplemental basic skills in reading, filling in the gaps with explicit direct instruction and guided practice presented in a fun and engaging format that builds your child’s confidence. 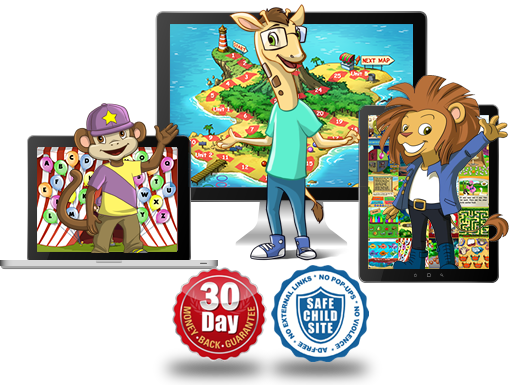 The fun and easy way to help improve your child’s reading skills anytime, anywhere. Learn pre-reading skills with lovable characters at a carnival, basic reading skills focused on phonics and sight words at a park that’s out-of-this-world, and more advanced skills with a pirate and his island friends. My son has been struggling with reading and this program has taught him so much in such a short period of time. His teacher has even noticed an improvement. I wish I knew about this program sooner! It's a definite A+++. I highly recommend Red Apple Reading. It is highly engaging and very visual! This program keeps my students excited and on task throughout each lesson. Customer support is also top notch! All I can say is WOW! After trying every program imaginable, this fun simple program has taught my Special Needs son to read and comprehend words and sentences. I am absolutely thrilled with this program! I am a homeschool mom of 3 and this is a great supplement to what we are already doing. It's a wonderful, kid-friendly program that my children can work with while actually learning at the same time, and it keeps track of how they are doing. Learn to read anywhere with over 1,000 activities!